Ariovistus was the chief of the Germanic Suebi tribe. He led his tribesmen across the Rhine into Gaul at the invitation of some warring Gallic tribes. 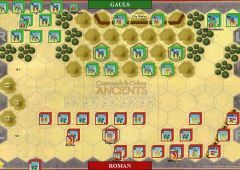 Once in Gaul, Ariovistus called on his German allies, the Harudes, Marcomanni, Triboci, Vangiones, Nemetes, and Sedusii to join his army. More Germans poured across the Rhine every day. 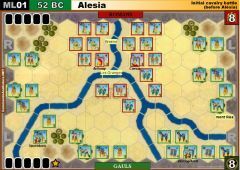 Caesar, aware of the mounting threat to the Roman province, advanced at top speed to the plain of Alsace within a few miles of Ariovistus’ army. At first, Ariovistus refused to fight, for diviners had foreseen that he was not destined to win before the new moon. 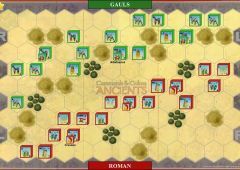 Caesar, forced the issue by deploying his legions near the enemy camp, a challenge that the Germans could not ignore. 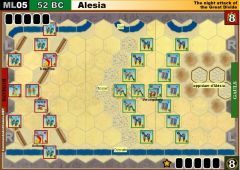 Ariovistus was compelled to come out and line up for battle. 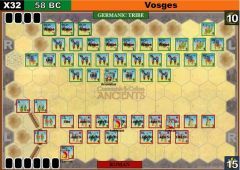 The German left wing looked weaker and it was here that Caesar launched his main attack with his favorite X Legion leading his right wing. 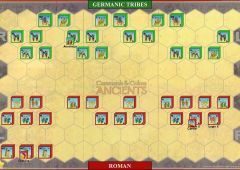 The Germans also favored their right and began to press back the Roman left. Then Publius Crassus (son of the Crassus of the First Triumvirate) charged forward with the cavalry to relieve the harassed Roman wing. This caused the pendulum to swing in favor of the Roman forces and soon the Germanic horde was in flight back across the Rhine. • Julian Legions rule is in effect. Played it twice yesterday with Daniele. Final scores were 7-1 and 7-0 for the Romans. 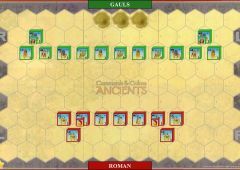 In both cases the Roman player had the possibility to advance Caesar rapidly on the right using right leadership and/or double time cards. 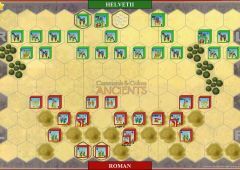 An attack by the Germans in the center-left Roman section seems possible and was partially performed in the second match. However, the German player just lacked the time to push the attack forward before his right wing started to crumble. 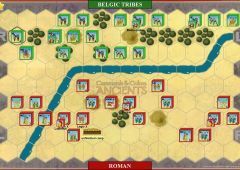 A possible tactic might be to retreat units away for the advancing Caesar instead of throwing them at him to try to stop his advance, which is pretty much what the German player did in our games. Well - I thought the Cav was "safe".... till you see Caesar run at you. No wonder he didn't use Cavalry much himself, the man runs like a horse. I wonder what other horse like attributes he had?? 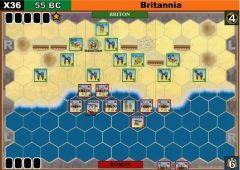 Bill won because he timed his Caesar attack very well - waiting till he could get three moves on the flank in a row. One to shuffle forward, then two to smash my forces. It was awesome to watch. The Germans, who where doing well in the centre and drifting to their right just couldn't hold it together any more and probably should have retreated out rather than try to win it since it was now so close - but at the time I didn't realise Bill couldn't order Caesar any more and assumed the next turn it was all over anyway! Pete and I played this again last night,swapping sides. 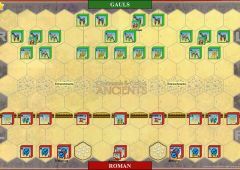 While the result was the same, (7-6 to the Romans) the game played completely differently. 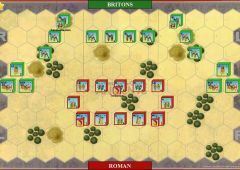 The beginning of the game saw light troops from both sides engaging with missiles to weaken the enemy line. 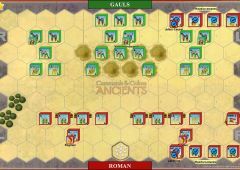 The Germans were the first to attack, thrusting at the Roman center. 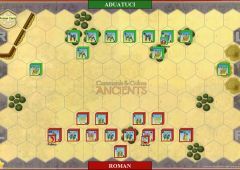 The Romans countered with Caesar leading the 10th against the German right flank. 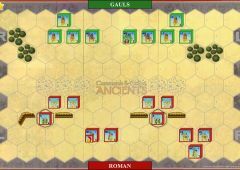 Within three turns Caesar smashed that flank, taking four flags without loss. 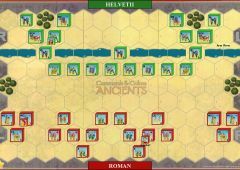 The Germans slowly ate away at the Roman center and turned on the Roman left flank, carving up some lights, and destroying a medium cavalry that could not retreat. With both sides at 5 flags the Roman cavalry attacked, but lost a unit in battle back, so was one flag down. 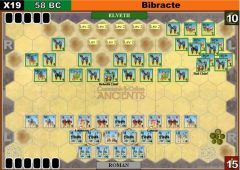 The Roman cavalry commander smashed one warrior unit, and a single Roman medium infantry was able to kill another with a 4 hit kill. Another really tight battle that was great fun. We played over VASSAL again, and completed the game in just over an hour. Leaders with heavy or medium infantry are very powerful. Caesar and a HI unit roll six dice, and will get a hit with each dice 50% of the time. The will get a second attack about every second time as well, making them the strongest unit in the game. Yep - my centre cards where sadly lacking... but to be honest I was really thrown early on by King Billy's charge with his MCs up my centre - I thought that left him vulnerable (which it did) - but it also left me vulnerable! I have vague notions of throwing stuff in the way of the warriors just to slow them down - and I like how Bill said I reenforced the centre with my cav and thinks I new what I was doing - because the honest truth is a felt very disorganised and somehow couldn't seem to get a cohesive defence or offence together. Caesar will be having a word about battle field order and extra training sessions all round! Looks an interesting scenario. 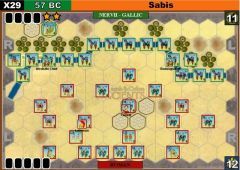 Lots of units with several powerful ones, but not many leaders in comparison, so, as you point out, it is important where your attack is made. I played this one as the Germans over VASSAL last night. 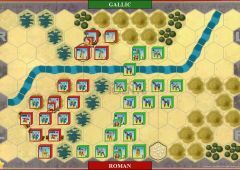 I originally wanted to attack with my right flank, but lack of cards made me attack in the center. I got first blood, but then lost all three of my medium cavalry. They did weaken the center and it appeared my opponent, Peter, was suffering a shortage of center cards. My warriors then got into the action, causing major damage. Their ability to advance and battle again without a leader is very powerful. 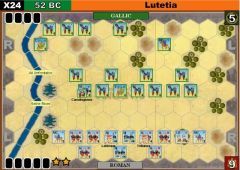 Peter reinforced his center with his cavalry and some lights, and we battled away with our units dwindling. He ended up with one cavalry unit with one block stuck out forward. I needed one flag to win (as did he) but now I was out of center cards! 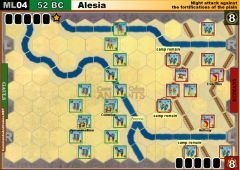 I threw my right flank at his, hoping my warriors could battle twice each. It almost worked, reducing a medium infantry to one block. 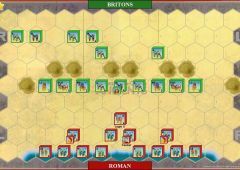 In desperation Peter threw two medium cavalry against a full strength light infantry on the base line. 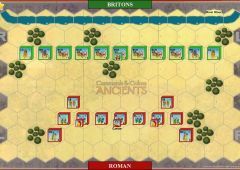 It shrugged off the first attack, but two flags from the second attack meant that it had to retreat off the board, giving Peter a very narrow victory, 7-6. 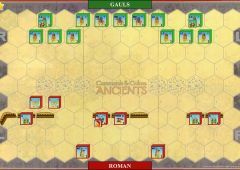 Caesar and the 10th Legion did not move throughout the entire game. The mere threat though was enough to be very cautious on my left. Good scenario, we will; have to play it again with sides reversed.